On July 31, the United States submitted its instrument of ratification to the International Atomic Energy Agency (IAEA) for the 2005 amendment to the Convention on the Physical Protection of Nuclear Material (CPPNM), having recently passed the long-gestating necessary implementing legislation. This development coincides with the imminent conclusion, at least in its current incarnation, of the nuclear security summit process, for which entry into force of the CPPNM amendment has been a key goal. With the summit process winding down but with much work remaining, it is vital that a process is initiated by which states can continue and expand on the substantial progress that has already been made. To that end, states should make use of the CPPNM Article 16 review conference mechanism, which would be triggered by eventual entry into force of the amendment. Although at first blush this might seem to be an abstruse concept, the review conference mechanism offers a much-needed forum for continuing discussions aimed at preventing nuclear terrorism. President Barack Obama initiated the nuclear security summit process in 2009, following his Prague speech, to address what he called “the most immediate and extreme threat to global security” by securing “all vulnerable nuclear material” in four years.3 The process has brought much-needed, high-level political attention to the threat of nuclear terrorism, convening more than 50 heads of government over the course of three summits—Washington in 2010, Seoul in 2012, and The Hague in 2014—to make concrete commitments to strengthen the global nuclear security system, enhance international cooperation, and upgrade domestic nuclear security regimes. In doing so, the summits have elevated nuclear security to the top of the international agenda. Now there is a pressing need to consider how to consolidate the gains already made and to ensure continued progress. Entry into force of the CPPNM amendment will contribute greatly to the overall strengthening of global nuclear security. As IAEA Director-General Yukiya Amano said in July, adoption of the amendment “is the single most important step the international community can take to strengthen nuclear security globally” and “would make it harder for terrorists to get their hands on nuclear material or to sabotage a nuclear facility.”4 It will significantly expand on the original treaty, which covers only physical protection of nuclear material used for peaceful purposes during and incidental to international transport.5 The amendment goes further by requiring parties to protect all their nuclear material, whether in domestic use or storage or in domestic or international transport, as well as their nuclear facilities used for peaceful purposes. To guide the establishment and maintenance of the physical protection system, the amendment obligates states to apply, insofar as is reasonable and practicable, a set of fundamental security principles that define the key elements of a state’s nuclear security regime, such as establishing a competent authority and setting up licensing and inspection systems to verify compliance with legal and regulatory requirements. The work of strengthening the global nuclear security system is not complete and must continue as long as the threat evolves. Major gaps in the system remain. There are no comprehensive international standards or best practices that all states must follow, adherence to applicable international legal instruments is not universal, the current system does not adequately cover the 83 percent of global stocks of weapons-usable nuclear material that are categorized as military material,8 there is still no established way for states to hold each other accountable for security, and more work is needed to reduce and eliminate weapons-usable nuclear materials. In addition, many states still need to strengthen their own legal and regulatory frameworks for securing nuclear materials and facilities, particularly in the face of emerging threats such as cyberattacks. The nuclear security summit process has led to progress in all of these areas. To ensure that progress continues, several features of the process should be carried forward. First, high-level attention achieved through participation by heads of government has prompted states to take steps to strengthen national and global nuclear security. Many states would not have taken these steps, at least not at such an accelerated rate, in the absence of the summits. Sustained high-level attention promotes the setting of priorities that catalyze actions domestically and in cooperation with other states, and it ensures that nuclear security remains on international and national agendas. Second, the summit process has helped to hold governments accountable for security commitments and has provided opportunities for building confidence in states’ national nuclear security regimes through information sharing—for instance, on relevant laws and regulations. Third, participation by heads of government has empowered senior officials to coordinate nuclear security initiatives within and across governments and motivated national implementation of commitments at all levels of government. Finally, the summits have facilitated identification of assistance needs and encouraged contributions to international organizations that provide such assistance. These features set the parameters for considering how the CPPNM Article 16 conference mechanism could provide a vehicle for ensuring continued progress. An integral part of many treaty regimes is a review process to ensure the treaty’s continued viability in light of changing circumstances. This is certainly necessary for nuclear security as states must contend with the evolving threat, the spread of nuclear technology, and advances in security practices. Review conference mechanisms such as Article 16 provide opportunities to bolster a treaty regime in a number of ways—for example, by developing common understandings of key provisions, setting goals to support implementation, and facilitating interaction and coordination among states. This is one reason that review conferences often become regular undertakings. In its original and amended versions, Article 16 requires only a single conference. A majority of the parties, however, can request the convening of additional conferences at intervals of at least five years.9 As noted above, the benefits of convening such meetings on a regular basis are clear, chief among them being the institutionalization of interstate collaboration to strengthen international nuclear security. There is sufficient precedent for regularizing these mechanisms. The nuclear Nonproliferation Treaty (NPT) contains similar language on review conferences.10 At each of the early review conferences, the parties to the NPT adopted the practice of requesting the convening of the next conference in five years’ time. At the 1995 NPT Review and Extension Conference, the parties agreed to continue holding such review conferences on a regular basis.11 In a similar fashion, the parties to the CPPNM attending the required conference five years after entry into force of the 2005 amendment could agree to convene these meetings on a continuing basis. According to Article 16, conferences are meant to “to review the implementation of this Convention and its adequacy as concerns the preamble, the whole of the operative part and the annexes in the light of the then prevailing situation.”12 As mentioned above, the 2005 amendment entails a general broadening of the scope of the CPPNM. Consequently, the scope covered by the conference mechanism will broaden as well, allowing states-parties to discuss steps taken to establish, implement, and maintain an appropriate physical protection system for all of their nuclear materials and nuclear facilities used for peaceful purposes, including the application of the fundamental security principles listed in the amendment, and all related issues. Article 16’s incorporation of the treaty preamble into the conference’s scope further provides the opportunity to raise topics for which no specific forum will be available following conclusion of the summit process and enables integration of the recommendations that have been developed to guide the establishment of comprehensive national nuclear security regimes. The new preamble contained in the 2005 amendment also broadens the possible scope of the review conferences by adding a reference to “internationally formulated physical protection recommendations,” recognizing that they provide “guidance on contemporary means” to secure nuclear materials and facilities. This clearly invokes the IAEA “Nuclear Security Recommendations on Physical Protection of Nuclear Material and Nuclear Facilities,” first developed in 1972 and currently in its fifth revision.15 These recommendations have already been the internationally recognized basis for physical protection for about 40 years, with the fifth revision explicitly designed to help states meet their obligations under the CPPNM amendment. The amended preamble takes this a step further and firmly integrates the IAEA recommendations into the treaty framework. In addition to providing a substantive foundation for interaction among states, the Article 16 mechanism could potentially involve all of the more than 150 states that currently are parties to the treaty. That would increase the number of participants threefold from the number that took part in the summits. The summit process never was intended to continue indefinitely. Heads of government have a long list of priorities other than nuclear security, and the tendency toward “summit fatigue” can lead to waning levels of ambition over time. At the same time, continued, high-level political engagement is required if the benefits of the summit process are to be maintained. Thus, a balance must be struck between the goal of regular, high-level political engagement on the one hand and a realistic timeline for meetings at the head-of-government level on the other. With the required interval of at least five years, Article 16 establishes a longer timeline than the two-year time frame of the summit process. The five-year interval has benefits and drawbacks. The longer period between conferences alleviates the sense of summit fatigue and provides a more realistic time frame for states to implement commitments and to see substantial progress. This is particularly true in areas in which progress can be slow despite high levels of ambition, such as eliminating weapons-usable nuclear material. Article 16 does not specify the level of government official that would attend Article 16 conferences and therefore provides flexibility as to whether they could be attended by heads of government, ministers, or other senior officials.16 Given the need to preserve the substantial benefits of engagement at the highest levels and because of the lengthy interval between conferences, it is reasonable to expect head-of-government involvement at an agreed point during the conference to make or validate commitments while ministers or other senior officials would represent states for the duration of the conference. The Joint Convention on the Safety of Spent Fuel Management and on the Safety of Radioactive Waste Management also has made use of the intersessional concept. The purpose of convening an intersessional meeting for this convention was “to continue discussions and apply improvements as well as to enhance the continuity and ongoing dialogue between Review Meetings.”19 In a similar way, although the Article 16 conferences would provide a structured framework for priority setting and accountability, annual intersessional meetings would ensure continuity of the nuclear security mission, motivate continued implementation of security commitments, and allow regular progress checks in the interim. In addition, they would enable governments to react quickly to changes in the threat landscape and identify continuing needs for assistance. Senior officials could attend intersessional meetings, much as the nuclear security summit “sherpas” do now in their regular preparatory meetings.20 One minister-level meeting between Article 16 conferences, perhaps held on the margins of other ministerial meetings such as those convened by the IAEA or the United Nations, also could ensure that nuclear security remains a high national priority even without the presence of heads of government. Annual meetings of senior officials would also be a means of maintaining a network of relationships among senior officials across governments who might not otherwise interact. Such interaction is vital to continued international coordination and cooperation on nuclear security. Intersessional meetings also could provide an opportunity for concurrent multisector engagement among different stakeholders on nuclear security by including sessions for nongovernmental experts and industry representatives. The benefits of multisector engagement have been apparent at the side meetings for nongovernmental experts and industry representatives prior to each official nuclear security summit. Expert involvement has often served to push a more ambitious agenda and generated creative ideas that have taken hold in the official process. Industry involvement is vital given that industry is responsible for implementing security on the ground, taking into account commercial and technical realities. The agenda for Article 16 conferences and intersessional meetings must be clear and robust enough to attract attendance by leaders and senior officials. In particular, there is a need to demonstrate the value of holding such regular meetings to states that may be hesitant to participate in light of their experiences with other, sometimes underachieving treaty review processes. As described above, the scope of Article 16 is flexible enough to consider a broad array of topics that were addressed by the summit process and that relate to the preamble or operative text of the CPPNM and its amendment.21 Most topics would be discussed in plenary sessions, but considering the large number and diversity of states-parties to the convention in comparison to the number of states participating in the summit process, meetings may need to be configured to allow for discussions among different constellations of states. For instance, topics such as military materials and plutonium management that may be applicable to a smaller number of states could be addressed in smaller working sessions. Broadly, Article 16 conferences must address the following remaining challenges that the summit process has only begun to address: strengthening security and building international confidence in the security of the 83 percent of global stocks of weapons-usable nuclear materials that are military materials, further developing the concept of international assurances and providing opportunities for confidence building, and tackling the thorny issue of minimizing the risks associated with growing stocks of separated plutonium. That these three areas lack a natural home outside the nuclear security summit process highlights the vital need for a mechanism for sustained, high-level political engagement. Article 16 meetings also would need to cover several broad areas that were addressed by the summit process but require continued attention: strengthening national legal and regulatory frameworks and implementation of nuclear security; promoting the adoption and implementation of IAEA guidance; encouraging the use of peer reviews; increasing law enforcement cooperation to tackle illicit smuggling and other crimes; developing technical solutions for improving security, such as waste management and cybersecurity; and minimizing and eliminating civilian highly enriched uranium through reactor conversions, down-blending, repatriation, and technology development to transition to low-enriched uranium fuels. Meetings also could provide opportunities to discuss ways to strengthen institutional capacity and governance to meet the needs of the international nuclear security agenda more generally, including efforts to develop international guidance and provide training and assistance. CPPNM Article 16 conferences and intersessional meetings should have several primary objectives. First, a key goal of Article 16 meetings would be to set international priorities for nuclear security, either reaffirming existing priorities or identifying new priorities as the threat landscape evolves. Intersessional meetings also would allow states to identify critical areas that require urgent action by states and, if necessary, to reset priorities. A second key objective is to provide accountability for implementation of security commitments made during and after the summit process. Article 14 of the CPPNM lays out a reporting process, requiring states-parties to inform the IAEA, as the convention’s depositary, of laws and regulations that give effect to the convention.22This reporting mechanism has been underutilized so far, but submitting such reports could be made a deliverable in the context of Article 16 conferences, with states providing regular updates. 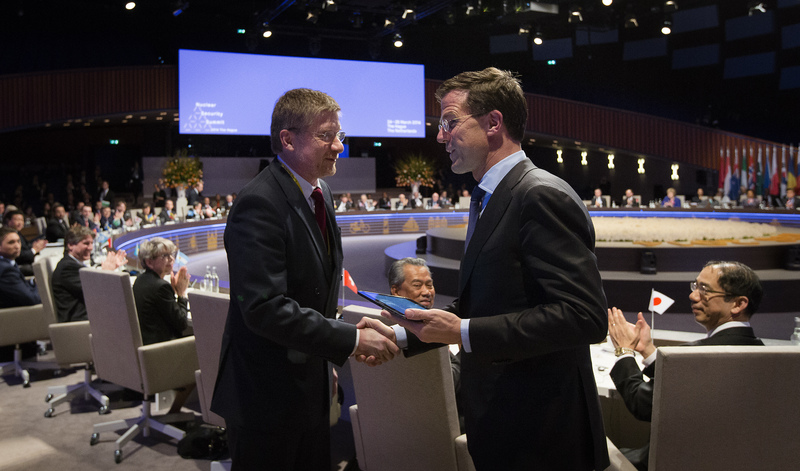 As Article 14 reports are distributed only among the states-parties to the convention, states also could provide public reports on progress, similar to the national progress reports and statements that are part of the summit process, to help build international confidence in the effectiveness of their security. Intersessional meetings would provide additional opportunities to track progress. A final objective is to encourage states to be more ambitious by making new individual and joint commitments in addition to tracking the progress of existing commitments. Making new commitments ensures that states are engaged in a process of continuous improvement that matches the pace of evolving threats and prevents progress from stagnating. With the nuclear security summits ending and major challenges remaining, it is vital to establish a mechanism to sustain and expand on the progress made at these biennial events. CPPNM Article 16, which will be triggered when the 2005 amendment to the convention enters into force, provides such a mechanism. Once an Article 16 meeting is set, it will be up to the states-parties to decide what the scope of the discussion will be, at what level they will participate, and whether to regularize the conference mechanism as a forum for sustained interaction on nuclear security. The summit process strengthened global nuclear security through unprecedented high-level attention and far-reaching commitment. Yet, the job of securing all nuclear materials and related facilities is not done; reverting to the old ways of incremental and ad hoc progress is not an option. Instead, states should use the Article 16 mechanism, based on an expanded and reinvigorated treaty regime in the form of the amended CPPNM, with a renewed sense of purpose to stimulate additional steps toward strengthening global nuclear security. 1. Trevor Findlay, Nuclear Energy and Global Governance: Ensuring Safety, Security and Non-proliferation (New York: Routledge, 2011), p. 132. 2. As of September 16, 2015. 3. Office of the Press Secretary, The White House, “Remarks by President Barack Obama in Prague As Delivered,” April 5, 2009, https://www.whitehouse.gov/the-press-office/remarks-president-barack-obama-prague-delivered; Office of the Press Secretary, The White House, “Communiqué of the Washington Nuclear Security Summit,” April 13, 2010, https://www.whitehouse.gov/the-press-office/communiqu-washington-nuclear-security-summit. 4. 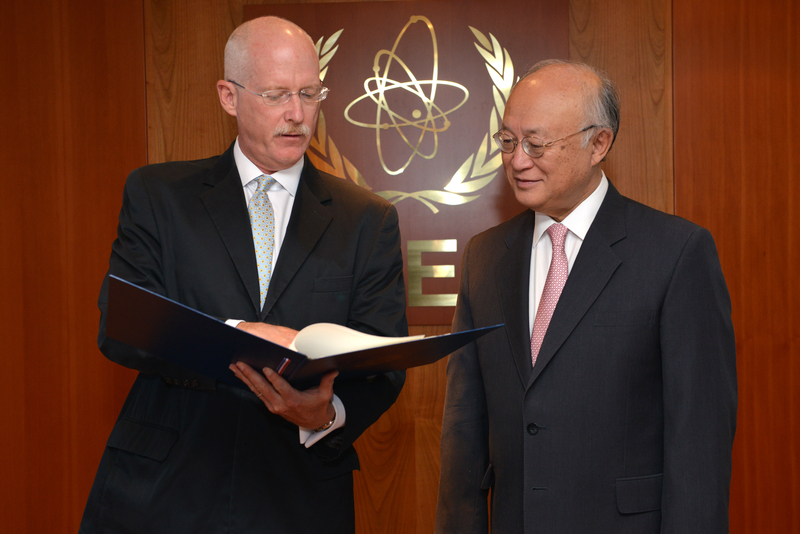 Rodolfo Quevenco, “United States Ratifies Key Nuclear Security Amendment,” July 31, 2015, International Atomic Energy Agency (IAEA), https://www.iaea.org/newscenter/news/united-states-ratifies-key-nuclear-security-amendment. 5. See Convention on the Physical Protection of Nuclear Material (CPPNM), October 26, 1979, 1456 U.N.T.S. 24631, art. 2, https://treaties.un.org/doc/db/Terrorism/Conv6-english.pdf. Compare this to article 2A of the 2005 amendment to the CPPNM, International Atomic Energy Agency (IAEA), “Nuclear Security – Measures to Protect Against Nuclear Terrorism: Amendment to the Convention on the Physical Protection of Nuclear Material,” GOV/INF/2005/10-GC(49)/INF/6, September 6, 2005, https://www.iaea.org/About/Policy/GC/GC49/Documents/gc49inf-6.pdf. In addition to physical protection measures, the CPPNM requires parties to criminalize and establish jurisdiction over certain offenses in their domestic systems. The amendment adds activities related to illicit trafficking and sabotage to the list of offenses that parties must criminalize. 7. In the official summit process, five working groups are considering ways to strengthen key international institutions and mechanisms engaged in nuclear security, including treaty regimes. Strengthening the CPPNM falls within the scope of the IAEA working group. 8. Nuclear Threat Initiative, “Non-Paper: Strengthening the Security of Military Materials,” n.d., https://www.nti.org/media/pdfs/Strengthening_the_Security_of_Military_Nuclear_Materials_1.pdf. 9. Although states could conceivably decide to call for an Article 16 conference before the amendment enters into force, they have not done so in the 23 years since the first conference. That first and so far only conference was notable for its brevity. States-parties acknowledged the adequacy of and reaffirmed their support for the convention, but did little more. There appears to be little appetite to request another such meeting without the boosting effect of the amendment’s entry into force. Five years after the entry into force of this Treaty, a conference of Parties to the Treaty shall be held in Geneva, Switzerland, in order to review the operation of this Treaty with a view to assuring that the purposes of the Preamble and the provisions of the Treaty are being realized. At intervals of five years thereafter, a majority of the Parties to the Treaty may obtain, by submitting a proposal to this effect to the Depositary Governments, the convening of further conferences with the same objective of reviewing the operation of the Treaty. 11. 1995 Review and Extension Conference of the Parties to the NPT, “Decision 1: Strengthening the Review Process for the Treaty,” NPT/CONF.1995/32 (Part 1), Annex, n.d., http://www.un.org/disarmament/WMD/Nuclear/1995-NPT/pdf/1995-NY-NPTReviewConference-FinalDocumentDecision_I.pdf. 12. The only difference between the two texts is that the original text mandates that a conference take place five years after entry into force of the convention, whereas the 2005 amendment requires such a conference five years after entry into force of the amendment. 13. IAEA, “Convention on the Physical Protection of Nuclear Material,” Legal Series, No. 12, 1982. 14. This is not to say that the preamble comprises binding obligations in the way the operative text does. A treaty preamble does not itself establish rights and duties for the parties, but rather sets common aims and is essential to treaty interpretation, among other things. 15. IAEA, “Nuclear Security Recommendations on Physical Protection of Nuclear Material and Nuclear Facilities (INFCIRC/225/Revision 5),” IAEA Nuclear Security Series, No. 13 (January 2011), http://www-pub.iaea.org/MTCD/Publications/PDF/Pub1481_web.pdf. 16. For example, NPT review conferences are attended by senior officials, with ministers or their equivalent participating as necessary. Heads of government have typically not attended review conferences, but, given the high priority that states have placed on nuclear security through the summit process, involvement at that level should continue. 17. Reference to the Biological Weapons Convention (BWC) intersessional process is not intended as a judgment on the utility of that process, which is the subject of substantial disagreement. Its inclusion has to do with the structure more than with the substance, as it demonstrates how states have established a process to sustain interaction in the interval between the main conferences. Substantively, an intersessional process specific to the CPPNM review conference mechanism would need to be defined by the states-parties. 18. See Seventh Review Conference of the States Parties to the Convention on the Prohibition of the Development, Production and Stockpiling of Bacteriological (Biological) and Toxin Weapons and on Their Destruction, “Final Document of the Seventh Review Conference,” BWC/CONF.VII/7, January 13, 2012, http://www.unog.ch/80256EDD006B8954/(httpAssets)/3E2A1AA4CF86184BC1257D960032AA4E/$file/BWC_CONF.VII_07+(E).pdf. 19. See IAEA, Joint Convention News, No. 3 (November 2012), http://www-ns.iaea.org/downloads/rw/conventions/joint-convention-newsletter-nov2012.pdf. 20. “Sherpa” is the term given to the government official who heads a country’s delegation in the preparatory phase of summit meetings and is in charge of conducting negotiations on the summit’s agenda topics and on eventual summit outcomes. 21. One area that would not fall within the scope of Article 16 conferences but has been discussed in the summit process is the security of radioactive sources. Jonathan Herbach is a research fellow specializing in nuclear security and arms control law at the University of Amsterdam in the Netherlands. Samantha Pitts-Kiefer is senior program officer for scientific and technical affairs at the Nuclear Threat Initiative.